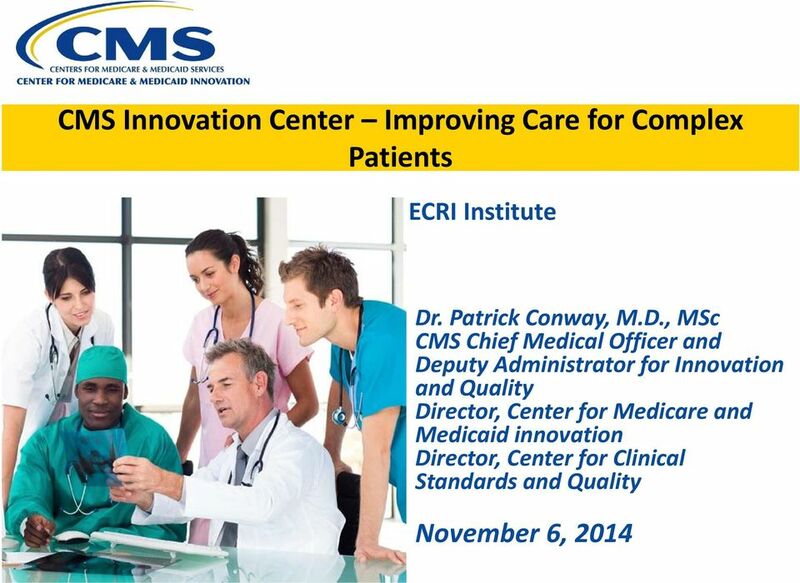 Download "CMS Innovation Center Improving Care for Complex Patients"
7 Comprehensive Primary Care initiative Risk Stratified Care Management for High Risk Patients: All CPC practices must demonstrate empanelment and risk stratification of the whole practice population, and care management of those at highest risk. 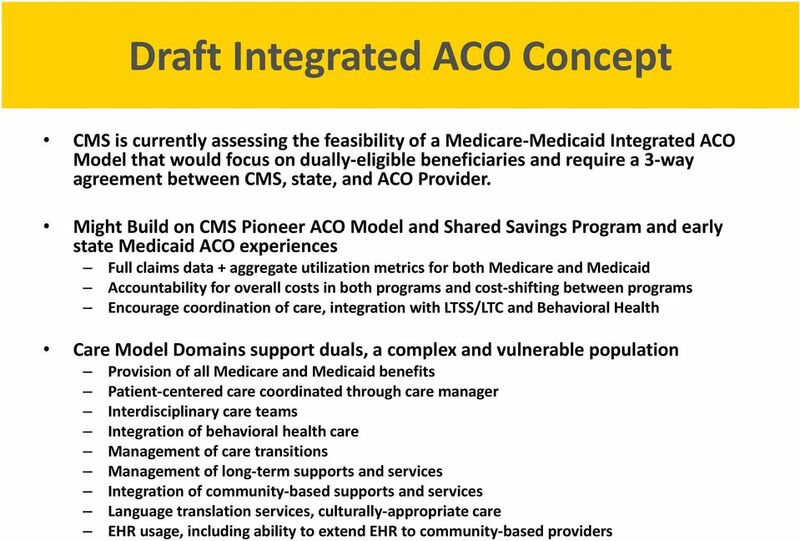 Practices receive a care management fee in support of this work, plus support through shared learning. 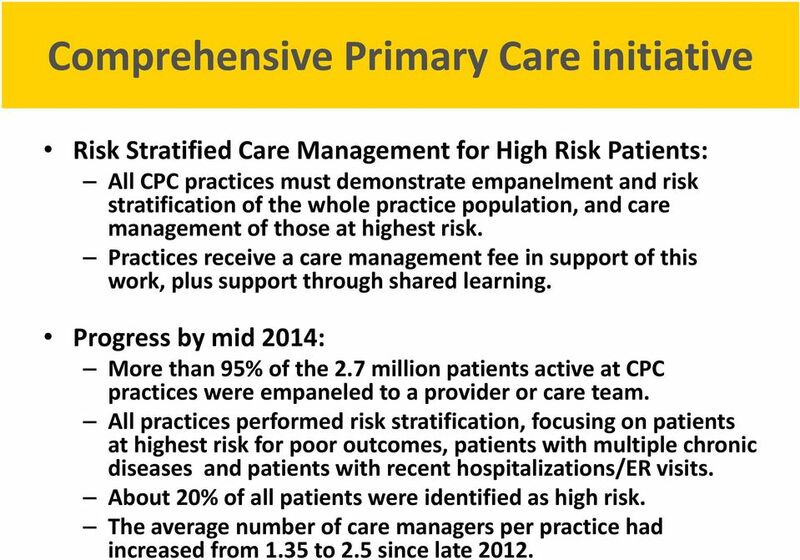 Progress by mid 2014: More than 95% of the 2.7 million patients active at CPC practices were empaneled to a provider or care team. 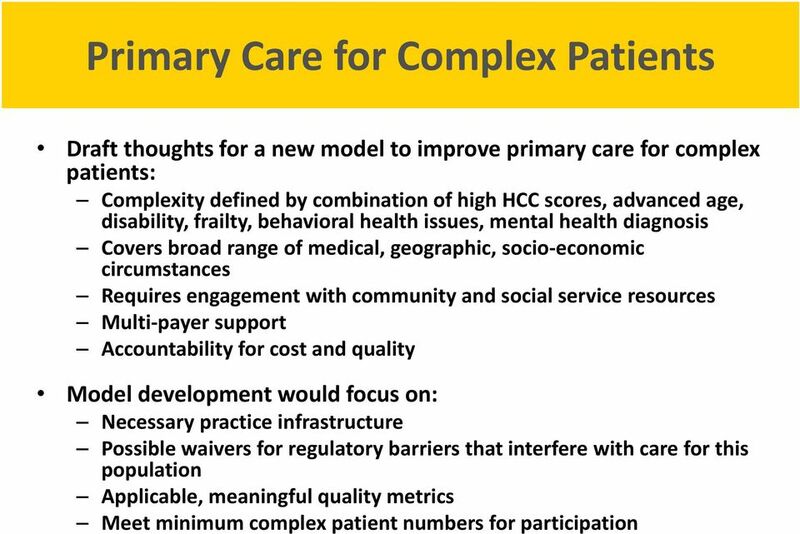 All practices performed risk stratification, focusing on patients at highest risk for poor outcomes, patients with multiple chronic diseases and patients with recent hospitalizations/er visits. About 20% of all patients were identified as high risk. 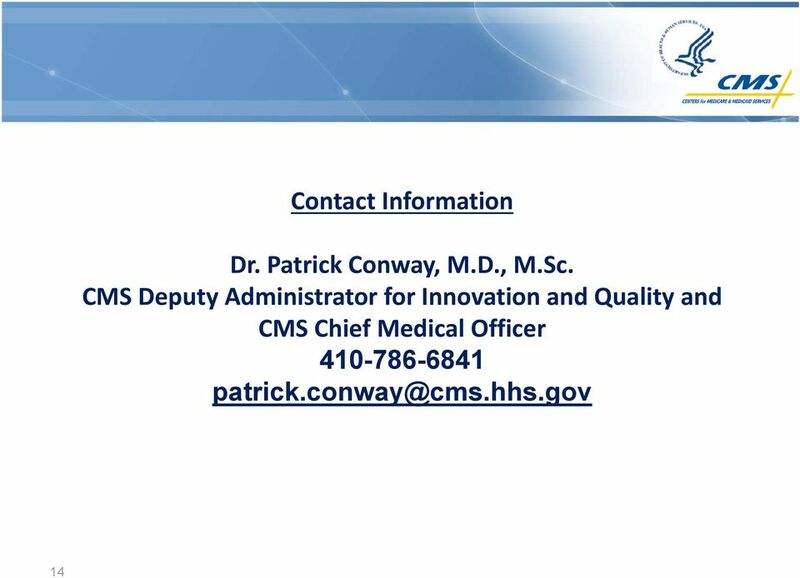 The average number of care managers per practice had increased from 1.35 to 2.5 since late 2012. 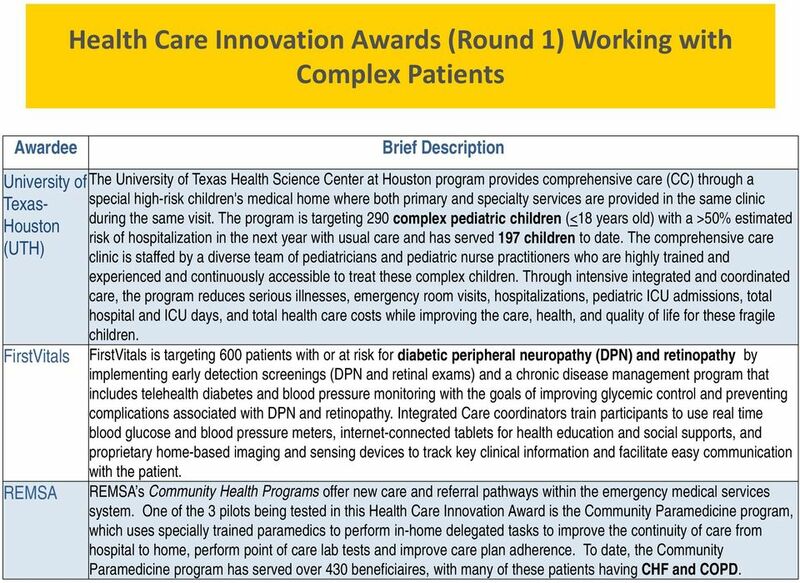 11 Health Care Innovation Awards (Round 1) Working with Complex Patients Awardee Brief Description University of The University of Texas Health Science Center at Houston program provides comprehensive care (CC) through a Texas- special high-risk children's medical home where both primary and specialty services are provided in the same clinic during the same visit. 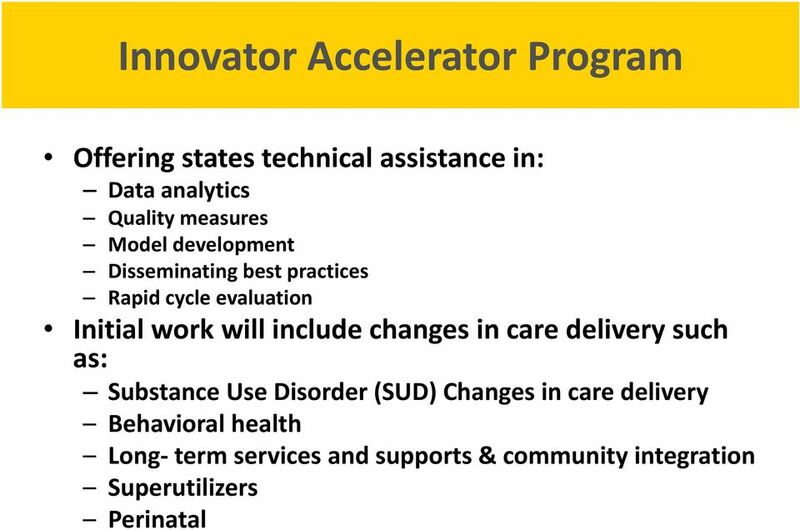 The program is targeting 290 complex pediatric children (<18 years old) with a >50% estimated Houston risk of hospitalization in the next year with usual care and has served 197 children to date. The comprehensive care (UTH) clinic is staffed by a diverse team of pediatricians and pediatric nurse practitioners who are highly trained and experienced and continuously accessible to treat these complex children. Through intensive integrated and coordinated care, the program reduces serious illnesses, emergency room visits, hospitalizations, pediatric ICU admissions, total hospital and ICU days, and total health care costs while improving the care, health, and quality of life for these fragile FirstVitals REMSA children. FirstVitals is targeting 600 patients with or at risk for diabetic peripheral neuropathy (DPN) and retinopathy by implementing early detection screenings (DPN and retinal exams) and a chronic disease management program that includes telehealth diabetes and blood pressure monitoring with the goals of improving glycemic control and preventing complications associated with DPN and retinopathy. Integrated Care coordinators train participants to use real time blood glucose and blood pressure meters, internet-connected tablets for health education and social supports, and proprietary home-based imaging and sensing devices to track key clinical information and facilitate easy communication with the patient. REMSA s Community Health Programs offer new care and referral pathways within the emergency medical services system. 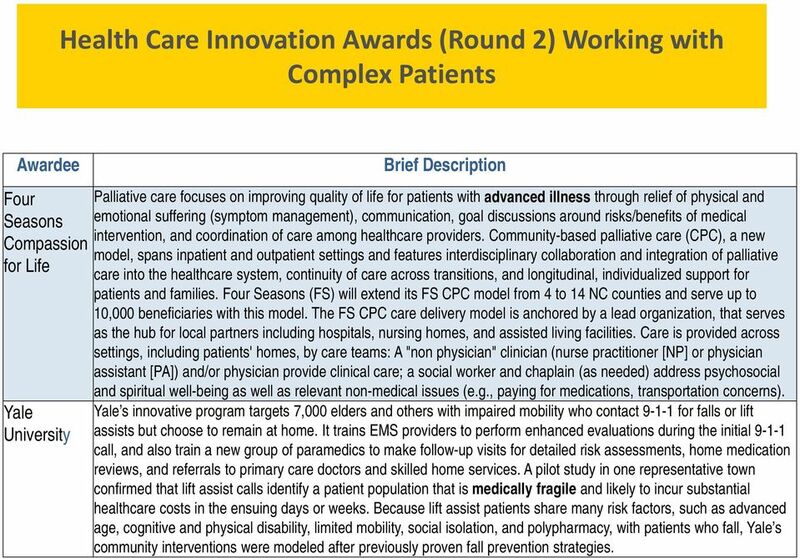 One of the 3 pilots being tested in this Health Care Innovation Award is the Community Paramedicine program, which uses specially trained paramedics to perform in-home delegated tasks to improve the continuity of care from hospital to home, perform point of care lab tests and improve care plan adherence. To date, the Community Paramedicine program has served over 430 beneficiaires, with many of these patients having CHF and COPD. 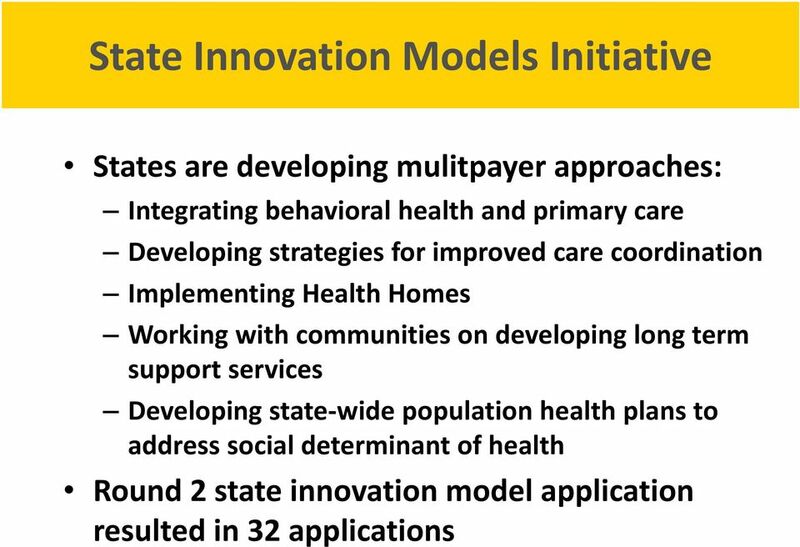 12 Health Care Innovation Awards (Round 2) Working with Complex Patients Awardee Four Seasons Compassion for Life Yale University Brief Description Palliative care focuses on improving quality of life for patients with advanced illness through relief of physical and emotional suffering (symptom management), communication, goal discussions around risks/benefits of medical intervention, and coordination of care among healthcare providers. 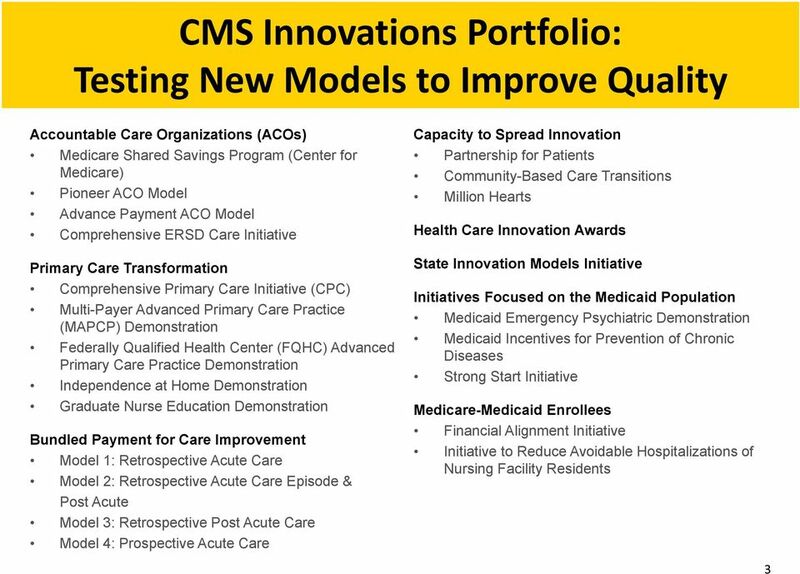 Community-based palliative care (CPC), a new model, spans inpatient and outpatient settings and features interdisciplinary collaboration and integration of palliative care into the healthcare system, continuity of care across transitions, and longitudinal, individualized support for patients and families. 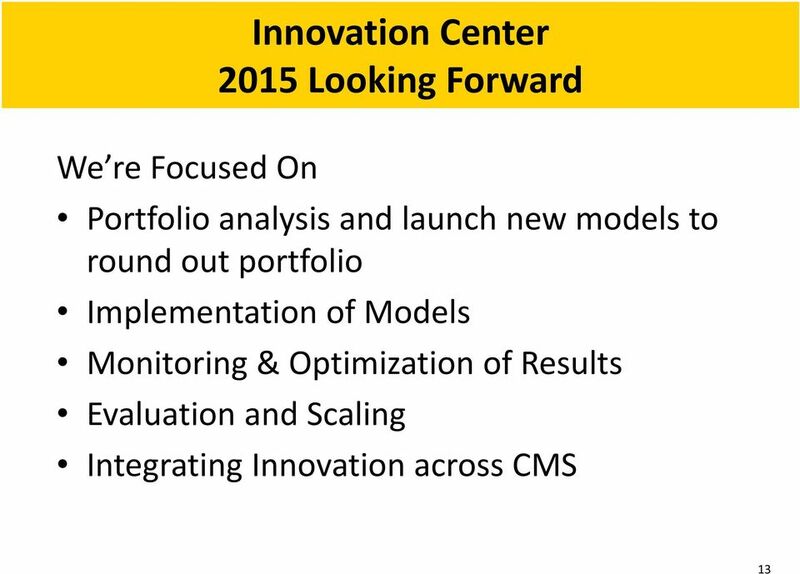 Four Seasons (FS) will extend its FS CPC model from 4 to 14 NC counties and serve up to 10,000 beneficiaries with this model. 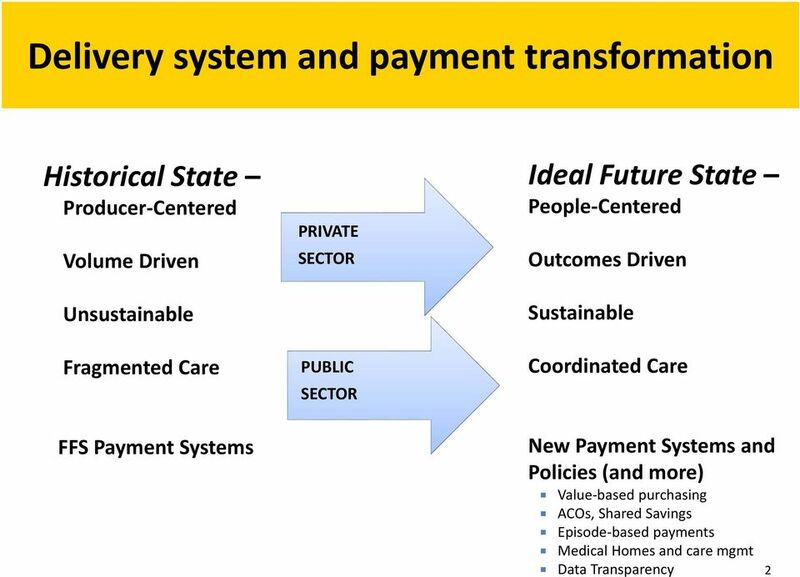 The FS CPC care delivery model is anchored by a lead organization, that serves as the hub for local partners including hospitals, nursing homes, and assisted living facilities. 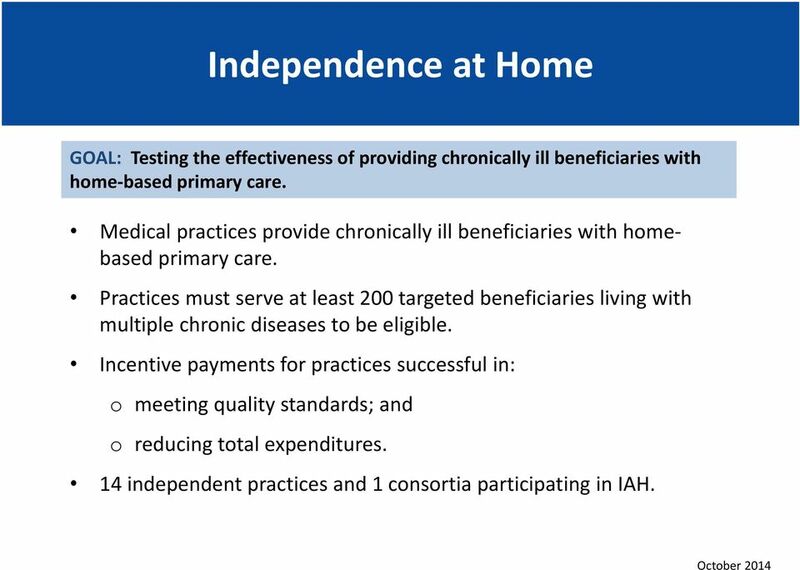 Care is provided across settings, including patients' homes, by care teams: A "non physician" clinician (nurse practitioner [NP] or physician assistant [PA]) and/or physician provide clinical care; a social worker and chaplain (as needed) address psychosocial and spiritual well-being as well as relevant non-medical issues (e.g., paying for medications, transportation concerns). Yale s innovative program targets 7,000 elders and others with impaired mobility who contact for falls or lift assists but choose to remain at home. It trains EMS providers to perform enhanced evaluations during the initial call, and also train a new group of paramedics to make follow-up visits for detailed risk assessments, home medication reviews, and referrals to primary care doctors and skilled home services. A pilot study in one representative town confirmed that lift assist calls identify a patient population that is medically fragile and likely to incur substantial healthcare costs in the ensuing days or weeks. Because lift assist patients share many risk factors, such as advanced age, cognitive and physical disability, limited mobility, social isolation, and polypharmacy, with patients who fall, Yale s community interventions were modeled after previously proven fall prevention strategies. 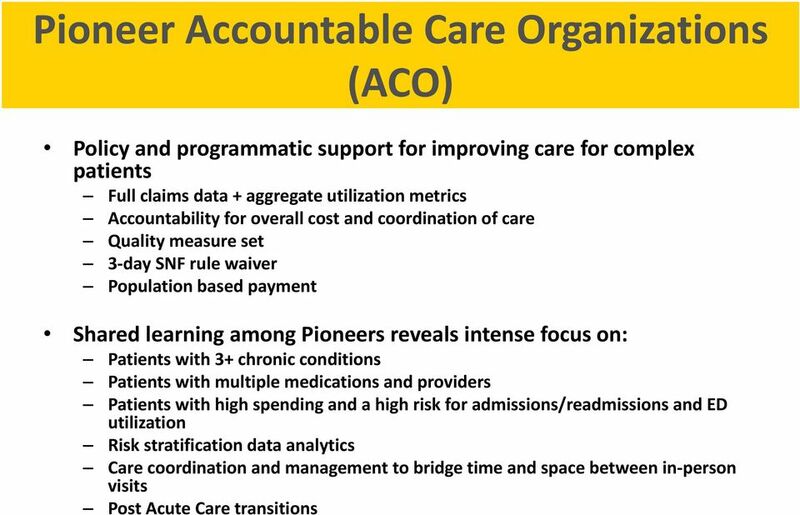 A predictive analytics platform powered by non-medical staff reduces cost of care among high-utilizing Medicare fee-for-service beneficiaries Munevar D 1, Drozd E 1, & Ostrovsky A 2 1 Avalere Health, Inc.
Addictions Services Refers to alcohol and other drug treatment and recovery services.